Hold this position for 30 seconds. Relax your head on the ball. Breathe naturally. Repeat 2-3 times. While sitting up straight, rotate your hips around in circles. First clock wise and then counter clock wise. Repeat each direction 30 times (30 circles). 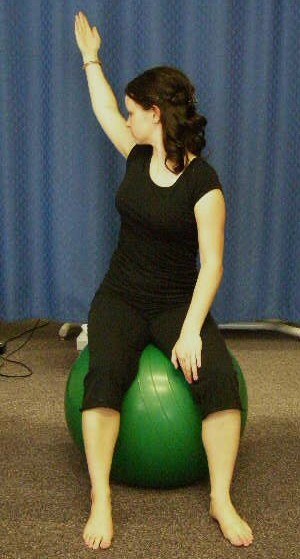 Sit up straight on ball. 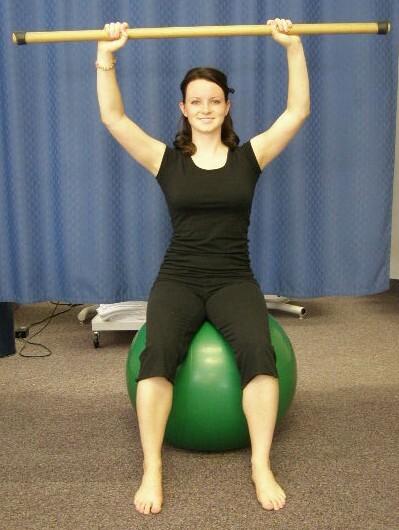 Maintain good posture while performing the exercise. Raise a "wand" over your head as high as you can. Keep elbows extended. Repeat 30 times. A good substitute for a wand would be a broom handle. This takes balance and coordination. Place yourself in a prone position over the ball. You will begin by having both feet (just the toes) and both hands on the floor. The knees are straight. Once you you feel steady, slowly raise right arm and left leg at the same time. Hold for 5 seconds. Slowly lower your arm and leg. Once you have regained your balance, slowly lift the opposite arm and leg (in this case the left arm and right leg). Hold for 5 seconds. Then slowly lower the arm and leg. Repeat this routine 10 times on each side. 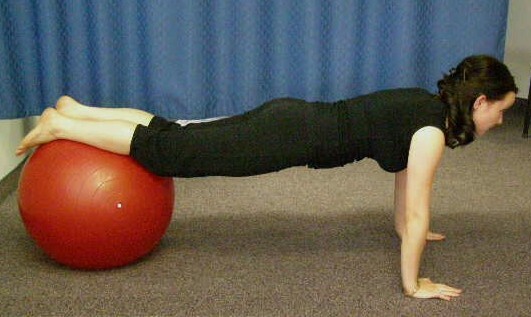 Begin by laying flat on your back with your heels resting on the top of the ball. Using your heels, pull the ball toward you as far as you can. Hold the position you see in the picture for 3-5 seconds. Repeat 30 times. 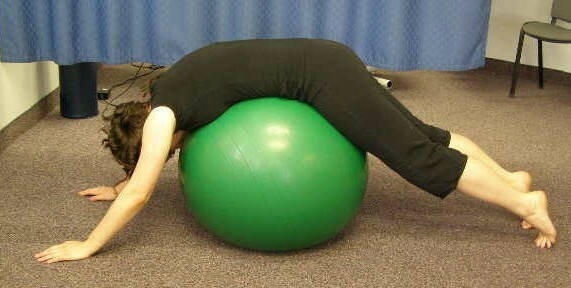 Begin by laying flat on your back with both heels resting on the top of the ball. Keep one heel on the ball while you raise the other leg 8-12 inches from the ball. Keep both knees straight. Hold the position you see in the photo for 5 seconds. Repeat 15 times with each leg. 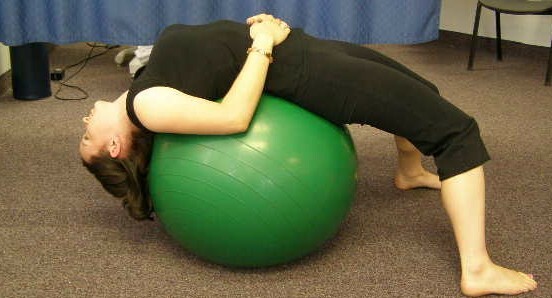 Begin laying flat on your back with your feet resting on the top of the ball. Pull ball toward you with your heels at the same time you lift your head and shoulders upward. Hold the position you see in the photo for 2 seconds before returning to the start position. Repeat 30 times. Begin by sitting on the ball facing forward. Sit up straight. Raise one hand upward while you rotate to that side (if you raise your right arm then you will rotate to the right). Repeat 15 times on each side. 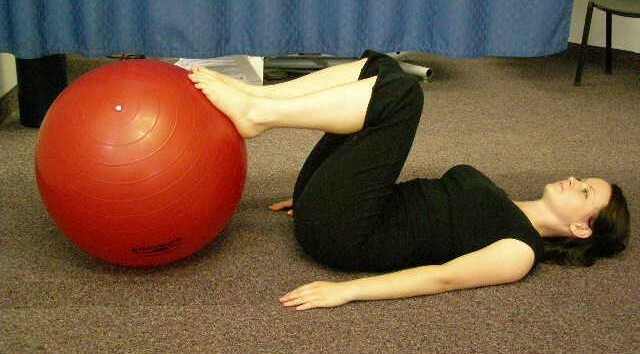 Begin by laying flat on your back with your feet resting on the top of the ball. Raise your hips upward until your trunk is straight. The challenge is to control the ball with your feet and not allow it to roll side to side. Once you lift your hips upward, hold this position for 3 seconds. Repeat 15 times. 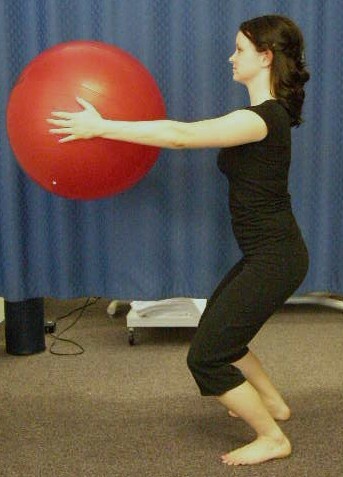 Place your lower legs on top of the ball (as shown). Put your self in the push up position. Hold this position for 5 to 10 seconds. Try not to let the ball roll side to side. Repeat 5 or 10 times. When in the Plank Position, perform push ups. Slowly lower your torso down until you touch the floor with your nose. Keep your spine straight. Repeat 5,10,15 times depending on your strength and skill level. Place yourself over the ball as shown in the photo. You should balance on your toes and hands. Keep your knees straight. Maintain the stretch for 30 seconds. Repeat 3-5 times. This is a good exercise to start with. 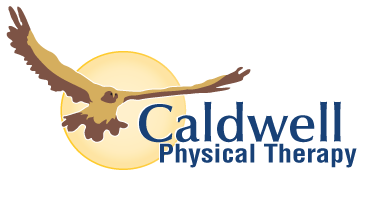 From this exercise you can move to others such as the Plank and the Quadruped Arm and Leg Lift. Hold therapy ball out in front of you. Your hands should be shoulder height as shown. Squat down while keeping your back straight. Squat down as far as you can while keeping your back straight. Repeat 30 times. Stand facing the wall. Place your hands at shoulder level on the wall as shown. Lean into the wall until your nose almost touches the wall. Push yourself away from the wall by extending your elbows. Repeat 30 times. 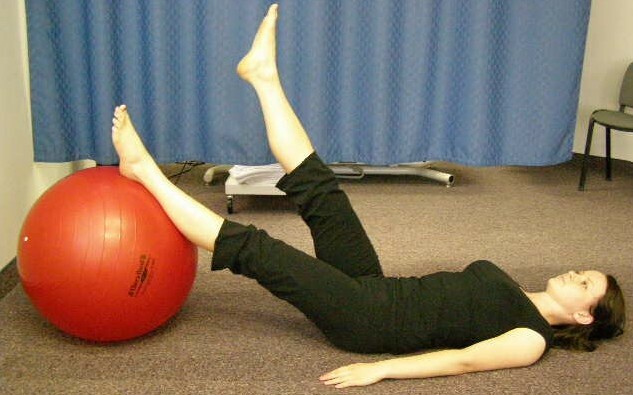 Begin by laying on your back with your lower legs resting on the ball. Keep your shoulders and back on the floor as you roll the ball far as you can to right/left without losing control of the ball. 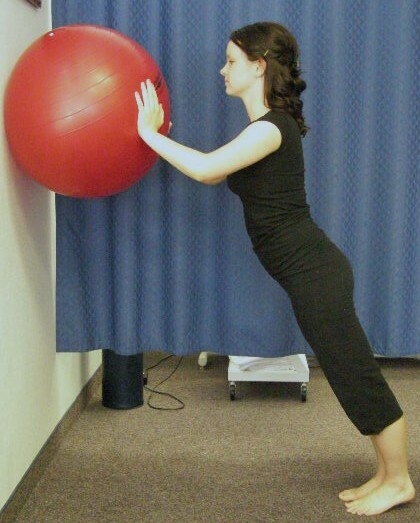 You should lift your hips and rotate your trunk as you roll the ball. Repeat 15 times to each side.